Elitegroup Computer Systems (ECS), the global leading motherboard, Mini-PC, Notebooks, mobile device, IOT, IOV, and smart solutions provider, is proud to announce the participation of the “2019 CES’’ at Booth #41954, Sands Expo, Level 2, Hall A-D , Las Vegas from January 8 to 11. We will introduce our latest technology and smart application equipment to provide complete solutions for smart living, transportation, modern classroom and so on. 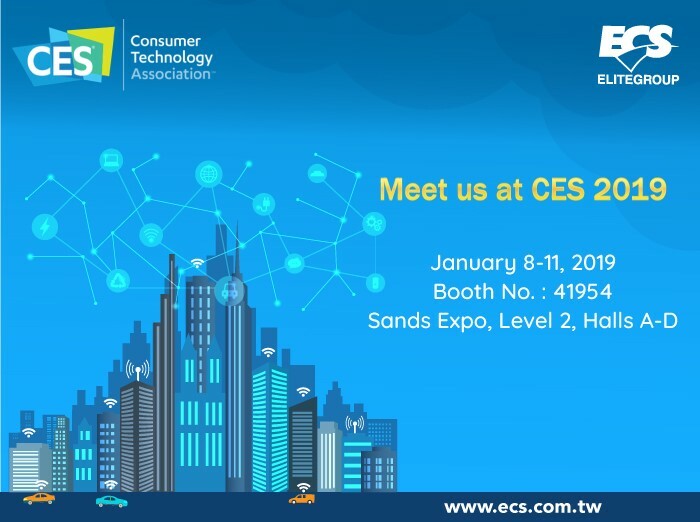 ECS will introduce all the new generation of LIVA mini PCs at CES 2019! The mini PCs can be used for home entertainments, smart offices, schools, etc. It can also be integrated with digital signage, and has been used successfully in smart retail solution and transportation. While artificial Intelligence has begun to play an important role in everyday life. ECS has implemented AI technologies in our LIVA Mini PC production and designs to create much more cost-efficient and advanced platforms. The new generation of LIVA M520 has a built-in Intel AI engine. It was designed for low power consumption, with WiFi connectivity, RS232 and GPIO headers extension. While the body was designed for small form factor, it has all the functions of AI PC capabilities. LIVA M520 can help you access to AI platform faster and easier. In addition, ECS has launched a new Mini PC with powerful AMD CPU built-in, and the capability of multi-threaded performance. It allows users to multitask and execute processes concurrently, this provides exceptional value for gaming and streaming, especially the capability to perform high quality video editing and fast video encoding. Moreover, ECS will also unveil our first Amazon Alexa built-in PC, and users can interact with Alexa in the same way as with other devices, such as listening to your favorite music and checking your schedule. Just let the AI system become a new generation of your smart living. Smart living is becoming the new trend in the modern society. ECS as a professional IT provider will be announcing the powerful voice-activated devices with on-site demo at CES. We will present our new product ‘’Sirocco’’: a battery-powered access point which provides voice activated user interface, and compatible voice assistance devices ; The users can get answers or control smart home devices wherever you are at home. Furthermore, ECS will present our ‘’Whirlwind’’ AI built-in display, which can communicate with your smart home kits across multiple platforms. With user-friendly interface that simplifies the system operating process, Whirlwind can make monitoring and managing the devices much easier. And it is worth mentioning that, ECS’s new AMA Bluetooth speaker can not only provide high quality sounds, but also has Amazon Alexa built-in. The users have full voice control of the speaker from a distance. Just control with your voice, it allowed you instantly play music, get practical information such as your personal calendar, news, radio, weather and much more! Through the smart connection, ECS voice smart device can control the lights and home automation systems, and create the new way of smart living. The IOV solution is one of the core business lines of ECS. The product design and development are aiming to the trend of automobile energy saving, intelligent connectivity and high-speed integration system, such as Smart Cockpit, connected mobility, ADAS Peripheral to provide a complete smart automotive electronic system solution and technical foundation for the future of transportation. ECS will present our latest Smart Parking system, with 360 degree camera and ADAS peripheral products, which combine with ECS blind area detection system to create a safer environment. Due to the technological improvements, stricter emissions standards, electric cars have become the mainstream. Therefore, ECS EV car control modules and charger were designed for an eco-friendly environment. Furthermore, ECS Connected Mobility Solution is to offer various options for optimized users’ logistic management and covering multiple segments of intelligent transportation systems. And ECS Smart Cockpit Solution integrates the advanced technologies and driver oriented human machine interface to create a seamless connection between human, vehicle and the road. ECS is focusing on building the best connected mobility terminal products which suitable for automobiles in the era of the connected vehicle and providing the best platform for the entire telematics era. ECS’s Smart Classroom solutions combine collaborative learning technology with diverse mobile devices, which promote interactive exploration of learning concepts and foster critical thinking and deeper understanding. Our Smart Classroom solutions include student devices, teacher device, wireless Access Point and interactive whiteboard for deploying intuitive and technology enhanced learning spaces that ensure more streamlined planning and efficient reform to achieve effective change that works towards improving student outcomes. With purpose-built education features of student devices, 76cm drop resistance, IP52 dust/water resistant, retractable carry handle, rotational camera and stylus, ECS’s Smart Classroom solutions help students to improve the way their active learning. CMAP (Content Management Access Point), a WiFi storage device that allows up to 50 simultaneous connections in classroom to stream huge numbers of video files, documents and data, allowing student to access it from anywhere any time before lecture so they can have more time to do hands-on activities in class. ECS Smart Classroom Solution, leverage our extensive experience to deliver learning solutions that enhance interactivity and comprehension.